Full-time higher education remains very much the preserve of 18-21 year olds and subjects studied, types of university attended and experiences of being a first year student were very different according to social and educational backgrounds, with more evidence of the relative disadvantages experienced by those from relatively disadvantaged backgrounds. University attended was associated with prior educational achievement, socio-economic background, age at entry, ethnicity and region of domicile, and in addition, subjects studied were stratified by gender, ethnicity and age. 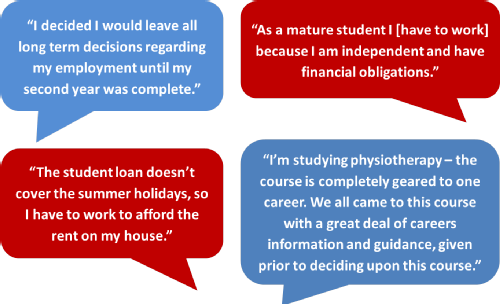 Stage 2 Report: Plans, aspirations and realities: taking stock of higher education and career choices one year on - Data collected in the summer and autumn of 2007. ‘A new classification of higher education institutions’, Kate Purcell, Peter Elias and Gaby Atfield.